Transparency, both physical and metaphorical, is the central preoccupation of David Spriggs’ artwork. In his 2014 exhibition, Transparency Report, he took classic 21st-century images of personal possessions inside a security scanner and turned them into haunting and gorgeously crafted art. 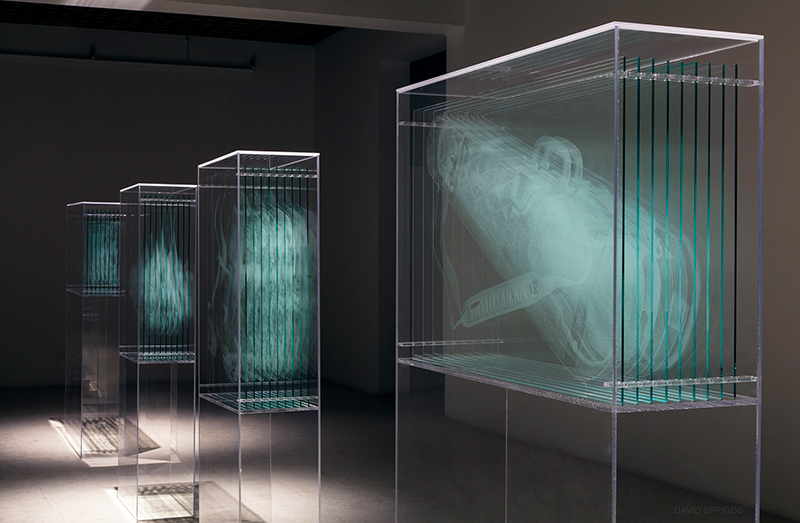 Spriggs creates his artwork by layering images in space – in this case by engraving multiple sheets of glass which are displayed in spaced layers in lucite cases to reveal the three-dimensional forms. While we generally link the idea of transparency with openness and honesty, these works reveal a darker side of transparency, in which individuals give governments and corporations the right to literally see through us and our personal belongings. Spriggs will further explore the intersection of optics and surveillance in an upcoming show entitled Prism – referring to both the optical apparatus and the NSA surveillance program – from January 29 to May 9 at Montreal’s Arsenal Contemporary Arts. This entry was posted in The Art of Science and tagged David Spriggs, Optical Physics, surveillance art, transparency art, Transparency Report. Bookmark the permalink.